ATM makes cooling devices that don’t fit neatly into categories. While their forms may be unusual, these devices can provide cooling in a wide variety of installations and are handy “problem solvers”. The Cool-stick 18 is useful for cooling enclosed flat panel displays, or moving air through closely-spaced shelves. It’s handy wherever there’s a need for a long, thin air moving device. 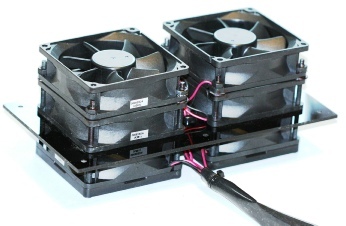 The System 4, listed as a cabinet cooler, is built around our “6 pack” fan module, shown here. The twin stacks of three 80mm fans let the module move significant amounts of air against back pressure (resistance to air flow) that single axial fans can’t cope with. Supplied with a multi-speed thermal control, this module can easily move air between cabinets.